Are you looking for this formal Response Letter to send a privacy complaint as a customer or patient? 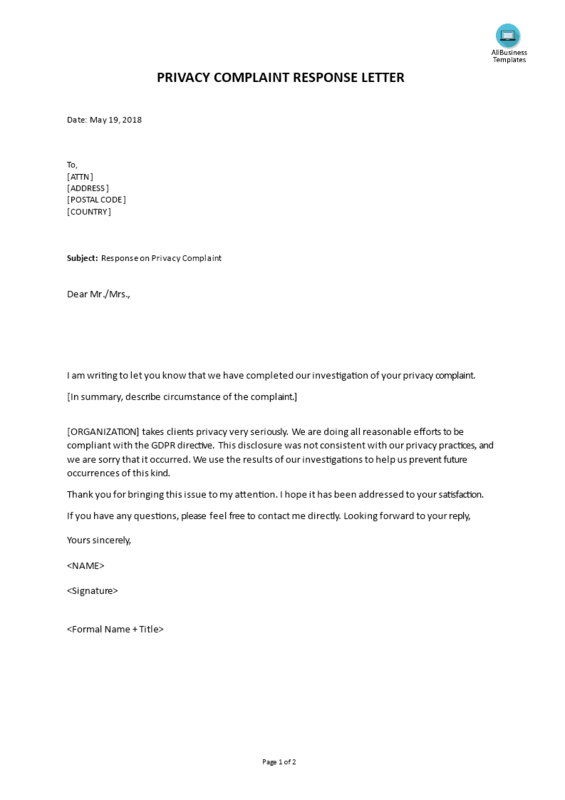 Download this Privacy Complaint Response Letter template now! The EU General Data Protection Regulation (GDPR) is the most important change in data privacy regulation in 20 years, it was enforced on May 25, 2018, at which time organizations in non-compliance may face heavy fines. The GDPR directive comes with a set of Rules and Regulations for the protection of personal data inside and outside the EU and affects all companies that save personal data from European citizens. Which is applicable to all international organization and which are defined by the GDPR directive as “organizations and its subordinate bodies governed by public international law, or any other body which is set up by, or on the basis of, an agreement between two or more countries” (GDPR Directive Article 4). We provide example GDPR related document templates in order to help you to comply with the EU GDPR regulations. These GDPR documents are provided in Microsoft Office formats, and easy to customize to your organization’s specific needs. Often completed example documents are also provided in order to help you with your implementation in order to save precious time. Download this GDPR Privacy Complaint Response Letter now or check out our fit-for-purpose GDPR Complete Compliance Kit templates as well! The document(s) will be available to download immediately after purchase is successful.